Earlier this week, we featured a video from Gothamist that highlighted the emotional misery that New York commuters experience on a regular basis via their mercurial subway system. In the interest of fairness, we decided it would only be proper to feature a video that tells the other side of the missing-the-subway story: that of two ill-fated strangers running alongside the train. Some might say that this video also underlines the heartbreak resulting from NYC’s mass transit system. This pair of subway idiots find true love in the course of their frantic platform dashes only to let it slip away. Is that not the definition of tragedy itself? Maybe. While chasing after subway cars, as in all life, we must appreciate the good moments and accept that they are fleeting. No relationship, at street level or below, can truly be labeled a failure after it produces a trove of warm memories. 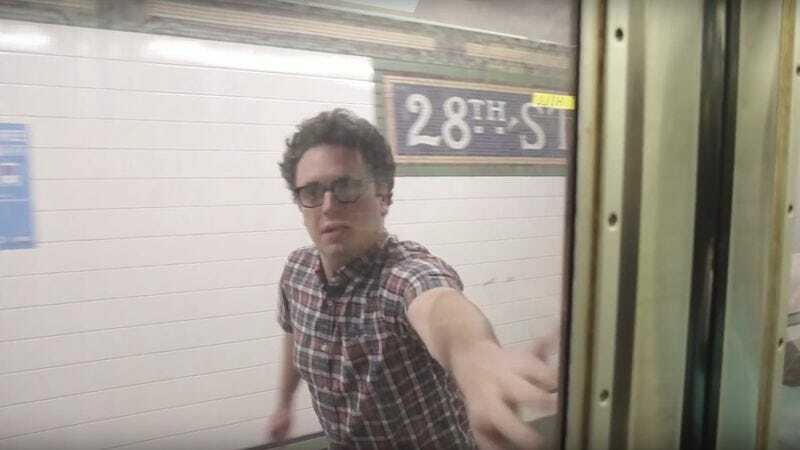 This reminder to focus on the important moments in life—the second installment in the life of a subway idiot—comes to us from Arthur Meyer, a staff writer for The Tonight Show Starring Jimmy Fallon. He’s previously provided such public service announcements as “The ‘Remember Your Stuff Before You Leave The House’ Song” (with Funny Or Die’s Zack Poitras). You probably won’t get that song out of your head anytime soon.